To register for the Y.E.A. Conference, please complete this sign-up process and submit information prior to March 15, 2019. During the next few weeks, you will learn more about the specific details of the conference, such as, specific presentations, speakers, and activities. Your organization can also help us advertise for this event by posting the conference information on your webpage, newsletters, and sharing the flyer with your employees and other organizations. The 6th Annual Y.E.A. 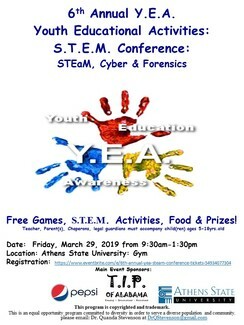 (Youth Education and Awareness) Conference is a children’s conference which will provide educational awareness in the areas of science, technology, engineering, art, and mathematics (STEaM), reading, leadership, and social media by providing STEAM related educational competitions and demonstrations for students in North Alabama. This conference offers STEaM activities to students so they can show case their talents through innovation, creativity, and skillsets by presenting and modeling their STEaM projects with their peers to compete for prizes and awards! In addition, exhibitors and presenters will offer interactive activities to challenge the minds and abilities of students in grades K-12th during the conference. This conference is held on the campus of Athens State University in Athens, Alabama.